Hi, Welcome to our blog. Here you can find interesting websites, games and lots of activities. Enter and enjoy learning English. Thanks to Masha for her video and her wonderful recipies. Children usually like cakes and they like chocolate too. Here you are a video of "How to Make Chocolate Brownies" by The Art of Hospitality School, which specializes in making food with kids. Why don't you try it? Listen to a girl in Ireland making prank calls at the age of eight. She doesn't like her school and she wants to get it demolished! What about you? Click here if you want to read the audio script. Here you have a great video to learn some Halloween words. It's been uploaded by Maple Leaf Learning.I hope you enjoy it. Help Buster to build an alien assembling different parts of the body. Click here to start. These three ladies are really funny, you can have a very good time watching them.Click here to watch them performing their wonderful song "Cheap Flights". They also have their own website with a multimedia section where you can enjoy a selection of videos of their shows. 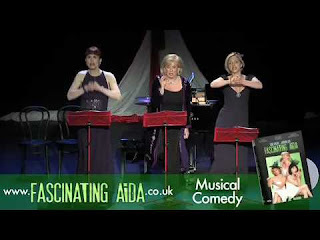 Click here to go to Fascinating Aida's website. What's the weather like in Ourense today? What's the weather like in London today? Do you want to talk to someone in English?